GeekGirlCon is here! 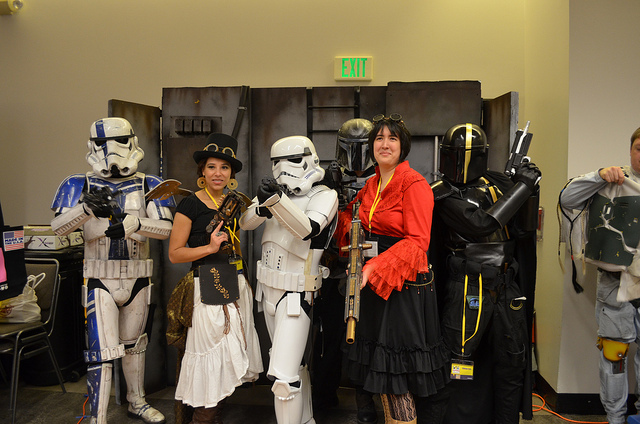 If you haven’t heard of GeekGirlCon before, you are missing out on a great event. While Cons have become popular with mainstream audiences, they can also be notoriously anti-feminist. Between Booth Babes dressed up as scantily clad female gaming characters and the on-going (ridiculous) debate about “fake” Gamer Girls, openly identifying as female in the geek community can be difficult. When you are online playing games, you can mute your microphone and let others assume you are male, hopefully avoiding harassment (Warning: link has NSFW language) and letting your skills speak for you. But why should women have to choose between the full gaming experience or harassment just for speaking with a feminine voice? Though if you go to a Con, you can’t hide your gender (not that you should have to in order to be taken seriously). Essentially, Cons are not known for being female-friendly (although many try to be). GeekGirlCon, however, is focused specifically on women in entertainment: movies, games, graphic novels, books and music. Many of these women are working as independent publishers and producers. There are no booth babes. It’s amazing to see so many women together, contributing to and creating a woman-friendly environment where people can openly speak about their experiences in their field. Many men come to the Con as well, supporting not only their mothers, sisters, friends, wives, and girlfriends, but also showing support for female-created works and incorporating those pieces into their own lives. There is room for both women and men in all these industries. However, until women can freely speak out without worrying about harassment, losing their jobs, or being asked to get back in the kitchen and make a “sammich” by their male partners/colleagues/co-players, GeekGirlCon is a nice refuge. But most importantly, GeekGirlCon is a stepping stone for young girls looking for their voice by being able to interact with women who have found their own voices already. You should support it.